Jim Dodson is a professional Realtor® at Bellator Real Estate & Development. He works in partnership with his brother, Charlie Dodson, as a member of The Dodson Team. Jim’s expertise in real estate lies in technology and online marketing strategies, with an emphasis on social media and search engine marketing. He specializes in new construction sales through our sister company, Truland Homes. 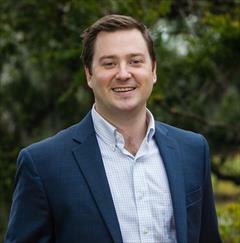 Jim is an expert on both Baldwin and Mobile County residential markets. Jim earned his Bachelor of Science degree in Consumer Sciences at the University of Alabama in Tuscaloosa, AL. He attended high school at UMS Wright Preparatory School in Mobile, AL, where he grew up with his sister and two brothers. Jim is a member of the Baldwin County Association of Realtors, Mobile County Association of Realtors, Mobile Real Estate Investors Association and is also a member of the Baldwin County MLS Board of Directors. He hopes to capitalize on the growing economy and help consumers successfully buy and sell homes for years to come. In his spare time, Jim enjoys golf and spending time with his growing family. He is married to his lovely wife, Lindsey Dodson, and they have a son named, James. Lindsey and Jim are expecting their second child in March 2017. Jim and Lindsey are members of Dauphin Way United Methodist Church.